Take a look at this video demonstrating Samsung's transparent smart window display. Now, you can superimpose Internet on the yard (if you're at home) or the building next door (if you're at work). The 22-inch panel runs at 1680 x 1050 resolution and has a 500:1 contrast ratio. Regular LCDs are only 5-percent transparent, whereas Samsung’s new panels increase that to 15-20-percent... During the day, it is ambient light that works as the backlight; two traditional edge-lighting sources are also fitted for nighttime use. H.G. Wells thought that transparent displays were a cool idea, too. 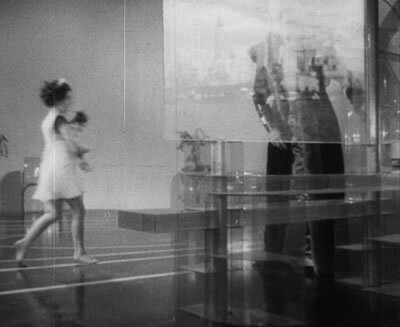 As you see in the screen capture below from Wells' prophetic 1936 film Things to Come, the technologically advanced society of the future makes use of widescreen transparent flat panel technology (see more transparent display pictures). As you saw in the video, the Smart Window can also be used in virtual window blind mode. Which reminds me of the polawindow from Frank Herbert's 1972 novel The Godmakers.